Advancing technology and a shift in work habits have seen more employees working out of the office by leveraging the use of mobile devices and cloud based services to improve business tasks. Creating solutions that map processes and increase productivity is a moving target. So what do we think will be the seven key enterprise mobility IT trends for 2016 ? As the number of mobile users increases so does the risk of a security threat. A mobile device with access to company resources can be a key target for theft as well as cyber attacks. If a device is lost or stolen what happens to the data stored on the device, or applications with access to company data? If that data is stolen or lost what would be the impact on the company’s reputation and how would it continue to operate? Data theft digitally can cause many problems. How are mobile users accessing data? Where is the data stored? Where are the devices used? Controlling the environment the devices can connect to and securing the channel of communication has become equally as important and securing the physical device themselves. Frost and Sullivan believes that security will be the biggest issue in the IT industry driven by rapid adoption of Cloud, Mobility and the Internet of Things. Expect a more heightened emphasis on data protection of enterprise mobile data on devices in 2016 and beyond. 2. R.I.P. Android in the Enterprise… well not quite.. If the future of Enterprise Mobility is tablet shaped then the resurgence of Microsoft Windows may give many cause to pause as they specify Android or iOS as platforms. We have seen Windows Phone take a real beating in the smartphone space, IDC believe that by the end of 2015 world wide share will be no more than 10.2%. Part of this is put down to the “app gap” a phenomenon where not enough apps are being developed – resulting in less take up for the OS. Apps in the “rugged” or Enterprise area often are highly customised or built to map a specific, often still paper based process so the appeal of Microsoft as a corporate platform is still attractive. According to Strategy Analytics Windows Tablet shipments are projected to hit 49 million units in 2019, a 120 percent increase from 2015 levels. So whilst Microsoft gets Windows 10 Mobile ready to fight Android and iOS more Enterprise clients will specify Windows 10 on an ever increasingly array of tablet devices as a preferred enterprise grade platform. World wide IDC believes that smartphone consumption will see it’s first “single digit” growth year in 2015. Those of us in the enterprise space recognise that generic smartphones can offer great value for money for some projects. But it is often discovered that each organization has unique mobile worker requirements making a one sized fits all phone a tough deployment and support proposition. LoB (Line of Business) rugged devices were in the past almost exclusively based on Windows Mobile 6.5 although now there are many Android devices available. They have been perceived as lacking in innovation, not surprising when compared to new shiney smartphones. However they can often have specific and high performance attributes built in that in the long run will enhance TCO. Features such as desk and vehicle docks, IP67 sealing, integral scanning and more robust construction plugs and sockets. Whilst the value proposition of consumer grade devices on any OS has been enhanced by device management solutions if the unit was never designed to be used in a line of business environment in the first place it can give rise to large failure rates. Up to 50% in some studies. LoB devices have not gone away they have just got a whole lot more relevant and less costly. Products like the new Aegex Windows Tablet aimed at the ATEX market is a case in point. Incorporating all the elements needed for an enterprise mobility solution in one offering funding and support wrapper is not new. Servitization challenges existing thinking so that the solution is configured more around the delivery of the clients service to “its” customer. Aston University Business School in Birmingham England think so much of this that they started a whole department built around the concept. The road to transform a business from a “manufacturer” to becoming the provider of a “service” is well explained in this video. This approach is the norm in some industries. It is likely that that train or plane you traveled on last was not ticketed owned serviced or staffed by the brand on the outside. More likely by a facilitating organisation that focuses on the delivery of some or all of the elements to you the end user. Cloud based apps, more flexible devices and MDM are some of the reasons we can expect mobility to be the glue that makes this initiative a reality. Look out of examples especially in scenarios where the client has high touch field based activities such as managing multiple contracts delivering field service or multi site FM. 5. Data data and even more data…. According to Gartner, by 2020, 25 billion devices will be generating data about almost every topic imaginable. 6. Cloud Based Apps on the Device on your Choice. What if your SME enterprise does not have access to in house IT or the budget to fund a traditional build from scratch enterprise mobility project ? The good news for 2016 and beyond is that many businesses already have competent devices in the form of SmartPhones or Tablets. Plus more line of business apps are deliverable via the cloud on a subscription basis. This will allow businesses to run a project with reduced up front and ongoing costs that address mobile and back office productivity and deploy it with an excellent ROI. We have heard lots about the adoption of the IoT but like RFID a few years ago can it break into the mainstream enterprise mobility sector. In 2016 the answer is…probably not. Gartner believes that the providers of Internet of Things platforms are currently fragmented and would benefit greatly from cobbling together a better ecosystem where data is shared more broadly. 451 Research believe that at the moment a relatively small number – Nineteen percent of companies are using, planning to use or will be evaluating the use of IoT in their organisations. A more immediate solution may well turn out to Near Field Communication (NFC) as a way of adding value in key deployment scenarios. What sets NFC apart from typical RFID is the nature of its peer-to-peer communication feature making it able to act both as a reader and as a tag. NFC has a become more available on all manner of consumer and LoB grade devices like the T1500 making it a popular choice for contactless payment. Have a great 2016, get in touch to arrange a webinar or meeting about your enterprise mobility project. 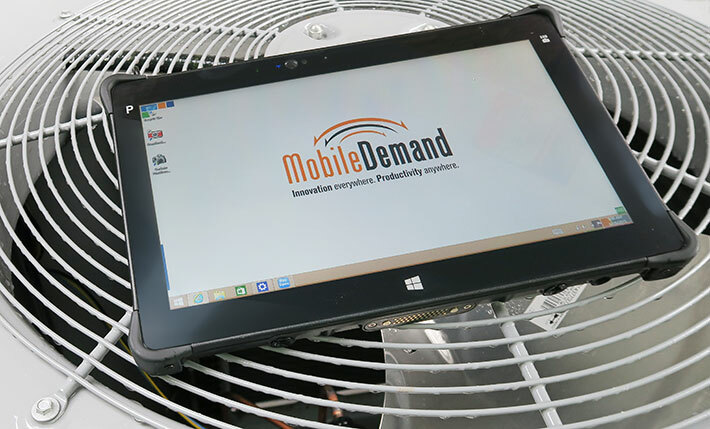 MobileWorxs are delighted to announce the availability of two new windows tablet devices joining the MobileDemand line up. 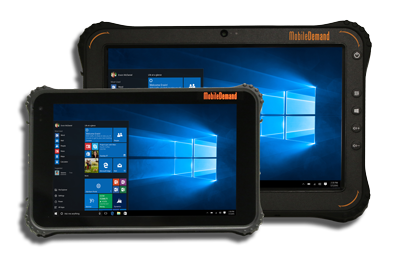 The 10.1″ xTablet T1500 and the 8″ xTablet T8500 are aimed at users looking for a high performance yet economic windows based rugged device to help improve mobile worker productivity. xTablet T8500 and xTablet T1500 ship with Windows 10 Professional. Breadth of functionality excellent security ease of navigation and seamless integration with corporate systems make this OS increasingly the standard when it comes to enterprise grade tablet devices. Both the devices use the excellent Intel Quad Core Z3735F processor operating at 1.33GHz with 1.83GHz burst frequency. Standard Wi-Fi & Bluetooth optional 3G WWAN. Applications that take place in rough and tumble environments require devices engineered to work and keep working. These new devices come with a 36 month warranty and deliver excellent multi year total cost of ownership combined with outstanding durability Vs similar priced devices. Airborne dust and water sealing rating for the xTablet T1500 is IP65 and IP67 for the xTablet T8500. Both handle 4-foot drops to concrete and come standard with hand strap, carry handle rubber bumpers and screen protector for added protection. Different applications and jobs require different functionality and accessories. Add a barcode scanner for inventory tracking or point-of-sale, deploy tablet mounts for a space-saving work station or utilize the GPS function for field based surveying. xTablet 8500 and xTablet 1500 will be available mid February. Get in touch to book a meeting. Research firm Strategy Analytics projects Windows gaining share on tablets as enterprise mobility tablet adoption and the demand for a premium OS on tablets grows. The research sees Windows tablet shipments projected to hit 49 million units in 2019, a 120% increase from 2015 levels. This would give Microsoft market share growth from the current 10% to 18% in the period most of the gain at the cost of Android which will fall from 68% to 58%, with iOS share staying at around 23%. Get in touch to book a webinar or meeting about Windows based enterprise mobility devices. Although they seem to forget Windows 8.1 and 10 the guys at Honeywell make some good points about choosing a mobile OS for Enterprise Mobility. No Zombies were harmed in the production of this video. Any similarities to a field service team you may know is purely coincidental. About a Halloween Zombie rugged windows tablet or anything else to do with an enterprise mobile project you may be working on. Before you ask the benefits of a mobile workforce solution can be far removed from just giving someone a smartphone a SIM card and an email account. A mobile workforce solution goes to the heart of what can still be a paper based process. Boost productivity by keeping employees in contact with staff vendors and customers. Close sales, solve problems and respond to urgent requests more effectively by enabling employees to work virtually anywhere. 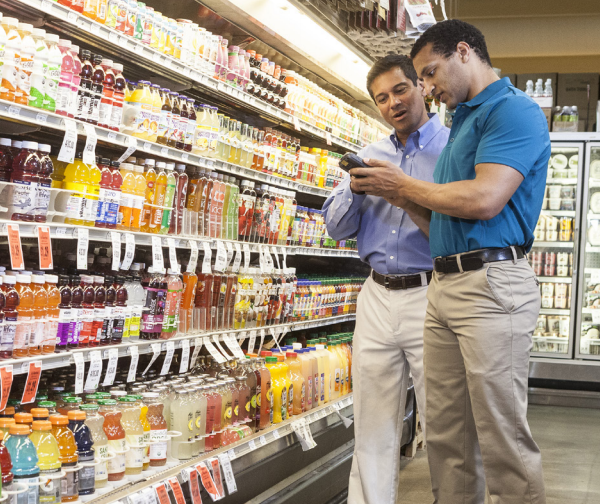 Improve service and satisfaction by interacting with customers in real time. Control IT and equipment costs and safeguard corporate data and apps. Mobile application development time – our enterprise mobility grade development platform enables the creation of apps in days rather than weeks. Devise as many applications as required and update applications instantly as business processes change. Remote workers jobs performed, clients visited or customer care tasks completed. 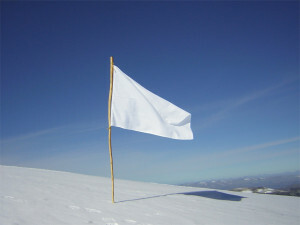 Time spent in the field by eliminating the need to return to the office to complete paperwork. Responsiveness and service to your customers – tasks dispatched instantly to remote workers in the field. Cost – Manual data entry errors and back office costs. Invoice billing cycle and accounts receivable lag time – completed job data received back from remote works in real-time. Reliance on expensive custom coding as a method of producing and updating applications. A complete unified enterprise grade solution for developing, testing, deploying, maintaining and updating cross platform applications..
Real-time access to data in the field so workers have the information they need when they need it. Create native Microsoft Android iOS and HTML layouts from the same application. Out of box integration with your existing legacy and ERP back end systems. The ability to deploy and manage from a single screen a variety of applications to multiple device types. Post data directly to the web for review by back office staff managers workers or customers. A compelling way to quantify the Total Cost of Ownership (TCO) of a project. We can either build an application for you or teach you how to manage the whole process yourself using a single skill set. 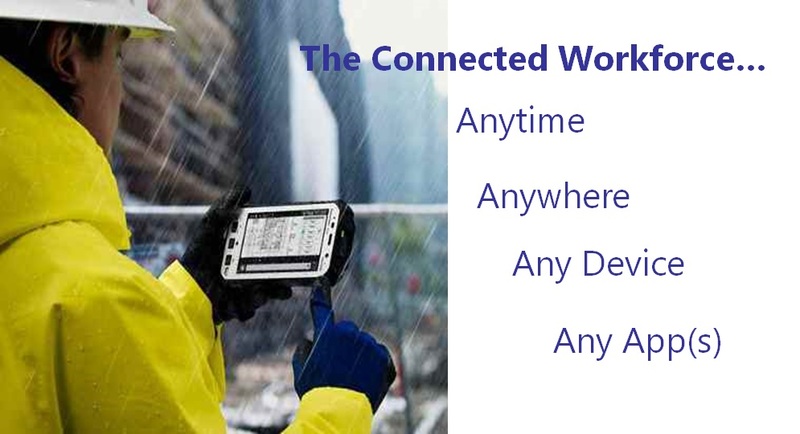 Book a meeting or webinar about how we can help you realise the benefit of mobile workforce solutions. Since launch xTablet T1600 has been positioned as a powerful Intel i5 based rugged tablet computer for those who need Microsoft Windows in the field. The device has become a favorite with those looking for a bigger brighter screen than most consumer tablets in an attractive package that can handle drops bumps and the elements without a drama. Display – T1600 has a huge 11.6″ screen 1366 x 768 pixel resolution 135 dpi. The screen uses capacative multi touch technology on three versions. Standard is rated at 400 nits with an outdoor readable version at 730 nits. A new active digitizer is a good option to have for anyone who likes to draw or annotate, or need extra precision more than is available via just finger touch. Integral Scanning – Honeywell Intermec EA31 2D CMOS imager module gives great scanning performance and low device power consumption. Drive – T1600 is now shipping with 128GB M2-SATA SSD as standard. Battery – T1600 has one Replaceable 45.8 watt-hour Li-Ion rated for around 7 hours of operation. A new optional: high-capacity 78.4 watt-hour Li-Polymer battery will be available in November. Windows OS – Choose Windows 8.1 Professional and now Windows 10 Professional. WWAN – T1600 has always been available with Wi-Fi and Bluetooth as standard. The unit now has optional: GPS, 4G LTE WWAN, NFC/RFID reader and mag stripe options. Vehicle Dock – New powered cradle for road vehicles and fork lifts. Carry case – All T1600’s come with a back of hand strap and carry handle, a carry case is now available in a number of configurations. Go to any event about enterprise mobility and be prepared to be blown away with a huge amount of material on security device management integration etc etc. It’s all good stuff but when it comes to setting up your project in the first place what are 4 practical enterprise mobility things to remember. You are investing in this technology to generate a positive business impact. Likely the process or workflow is either paper based or using an earlier form of mobile tech perhaps on defunct or unsupportable systems. The important thing is does this process map either how the organisation does this task now or how they intend that it should work. The scope for process re-engineering does not come along very often, make sure you take the opportunity to question the norm. Once your app has been built test it on your selected devices – A step easily forgotten but it’s important. Not all enterprise mobility apps and deployment scenarios are suited to a smartphone. If you are using line of business devices they all behave slightly differently, how does your app run? How do users get on with devices ergonomically? What are comms like in the locales where the devices will be used? A large retail stock control project we were recently involved in rejected one device as the scan trigger was considered badly positioned, not something to find out the morning you deploy 100’s of devices. Ask for feedback from the people who will actually be using the mobile application. It does not matter what the app does if the mobile worker is not able to use it successfully. Keep it simple, going from a paper based process to a mobile device is a paradigm shift so plan ahead and do not do the project in isolation. Take the time to train your team and familiarise them with how the apps and devices work. User experience is paramount. Not everyone is as familiar with technology as we like to think. Task a project member to help others understand how to operate their new device. You know how to turn it on when to charge it and how to flip from numeric to alpha keyboard but does everyone? Host a workshop or create a user guide. Key Point, No matter how bang up to date your app, deployment or integration, user adoption is critical to project success. Vehicle Mount computers or terminals have been around the warehouse for many years. Typically they have been used for pick and put away of palletised product in warehouses and docking environments. 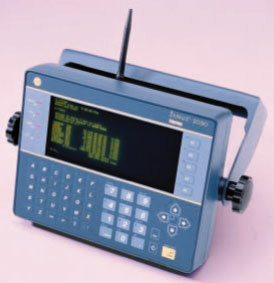 The operator often using a tethered or bluetooth barcode scanner to record locations and products into an inventory or WMS application. So why are clients looking at using a windows tablet on a forklift instead? 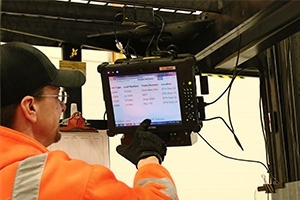 Dedicated large screen fork lift terminals or vehicle mount computers allows users to view data or run a terminal emulation session usually into a warehouse management system. But they tend to be expensive somewhat one dimensional and some still run proprietary operating systems and can have smaller screens than might be expected. Larger screens – take advantage of sealed rugged designs using solid state drives up to 11.6″ diagonal screen in an enclosure built for rugged use. Broad range of tablet form factors from MobileDemand and Zebra. Android or Windows 10 OS – making for easier integration into warehouse management systems (WMS) and other legacy solutions. Integral 2D scanning for situations where the operator can detach the tablet and start scanning items while on foot. Enabling ROI through the creation of more flexible shift patterns for stock check by using devices on or off the forklift. Sign on screen allows an internal POD to transport staff. Integral cameras allow warehouse staff to snap a picture of damaged product straight away. Users are finding that in a number of scenarios forklift staff are now being asked to carry out multiple roles making the ability to walk around with a multi purpose device all the more attractive. 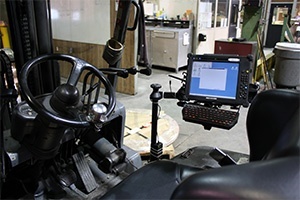 Which makes using a rugged tablet a viable alternative to a dedicated forklift mount computer. 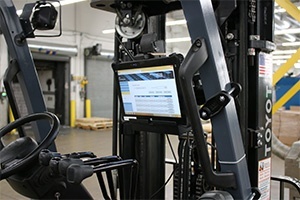 Get in touch to learn more about using a windows tablet on a forklift.